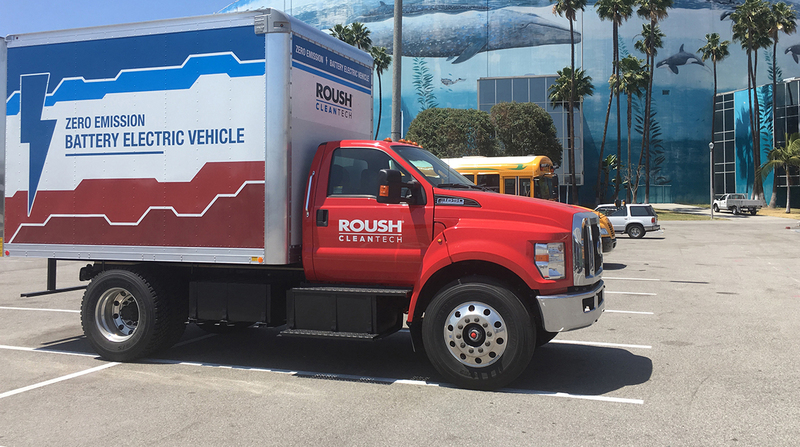 LONG BEACH, Calif. — Roush CleanTech unveiled its all-electric technology in a Ford F-650, marking an expansion of its alternative-fuel market beyond propane autogas and compressed natural gas. The company is currently participating in Ford’s eQVM process to become an Advanced Fuel Qualified Vehicle Modifier for electrified powertrains for commercial vehicles. It exhibited at the Advanced Clean Transportation Expo here April 30-May 3. Built on the Ford F-650 medium-duty chassis, Roush CleanTech’s new vehicles will have a lithium ion battery system of up to 225 kilowatt hours and 700 volts. Depending on the vehicle’s gross vehicle weight range, the average range will be up to 120 miles with a top speed of 75 miles per hour. The AC permanent magnet motor will have a continuous-rated power of 150 kilowatts, 200 horsepower, with a peak-rated power of 250 kilowatts, 335 horsepower. “An electric-battery option for medium-duty trucks and buses is a great fit as there is increasing demand in this gross vehicle weight range with very few original equipment manufacturer solutions,” Roush President Todd Mouw said in a statement. Roush CleanTech is a division of Roush Enterprises based in Livonia, Mich.